Donald Trump’s inaugural committee has announced that six faith leaders will take part in his swearing-in ceremony by offering prayers or delivering readings. 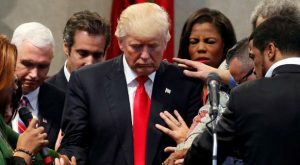 Among them are Rabbi Marvin Hier, founder and dean of the Simon Wiesenthal Center, and Bishop Wayne Jackson, who draped a prayer shawl from Israel over Trump’s shoulders when Trump made a campaign stop at his Great Faith Ministries International church in Detroit for a scripted interview. Here’s more on the other announced speakers: Paula White, Franklin Graham, Samuel Rodriguez and Timothy Dolan. 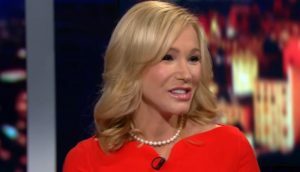 Paula White has been in Trump’s “Amen Corner” of prosperity gospel preachers for a long time; she has said that she gave Trump a Bible signed with a “prophetic word” by Billy Graham for his 60th birthday. Think of Paula White’s ministry as the church version of Trump University. She preaches the prosperity gospel, an approach to Christianity that is, shall we say, unorthodox. Prosperity-gospel preachers teach that God wants people to be rich, and that he makes them wealthy as a sign of his blessing and favor; the richer you are, the more God loves you…These preachers also teach that the way to become wealthy is—you guessed it!—by giving them money. If you make a “seed offering”—and the bigger the better—then preachers like White say the Lord will repay your generosity with bounteous riches. The Florida-based White helped organize a group of prosperity gospel preachers and televangelists who met with Trump in September 2015 and spoke at a Trump rally in Orlando in March. As we’ve noted, it’s not terribly surprising that Trump and White would find an affinity for each other, since she and other prosperity gospel promoters preach that wealth is a sign of God’s blessing and he told voters that his being rich was proof that he could lead the country. White was one of the money-making evangelists who reportedly stonewalled an ultimately inconclusive investigation by Sen. Chuck Grassley’s Senate Finance Committee, citing religious freedom to justify their refusal to provide full information about their finances. Never Trump conservative Erick Erickson has criticized White as “a Trinity-denying heretic” and said “it should be a pretty damn big deal” that Trump is inviting her to pray at the inaugural. 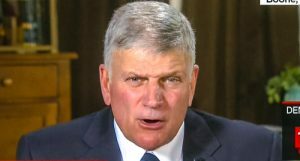 Franklin Graham, son of the iconic evangelist Billy Graham, is a more intensely anti-gay right-wing version of his father, and reflects the continuing spiral of America’s right wing into anti-Muslim conspiracy-theory paranoia. Like Trump, Graham is a fan of Russian strongman Vladimir Putin, praising Putin’s anti-gay policies and defending his support for the Assad regime in Syria. Graham went to Russia in 2015, where he praised Putin while criticizing secularism in America. While in Russia, Graham told a reporter that President Obama was “leading America down the wrong road” and “taking a stand against God.” Graham also planned to host a conference in Moscow with the Russian Orthodox Church to address anti-Christian persecution, but had to cancel after Putin outlawed evangelism from Christians who aren’t members of the Orthodox church. Although Graham maintained that he was not formally endorsing a presidential candidate in 2016, he held rallies around the country during which he made it clear what he thought Christians’ duty was at the ballot box. Graham, who has said the advance of legal equality for LGBT people is a sign of the coming End Times and invites the judgment of God, repeatedly said that 2016 was the last chance for Christians to save America from godless secularists and the “very wicked” LGBT agenda being promoted by the Obama administration. Following the election, Graham addressed a Trump victory rally and claimed that Trump had been elected thanks to God’s intervention. 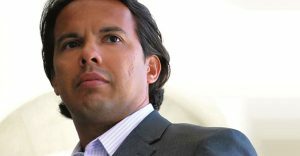 Samuel Rodriguez, who heads the National Christian Hispanic Leadership Conference and is a regular speaker at Religious Right gatherings, has fostered a media image as a nonpartisan moderate while simultaneously urging Hispanic voters to support right-wing candidates and Religious Right causes, and even filming a video promoting the Republican Party’s faith outreach project. In May, for example, he said it would be “morally reprehensible” for Christians to vote for a candidate who supports Planned Parenthood, saying they would need to repent. Rodriguez, who served on Marco Rubio’s faith advisory board, was initially critical of Trump’s anti-immigrant rhetoric. 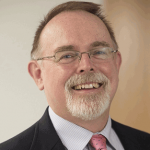 In July 2015 he joined the Southern Baptist Convention’s Russell Moore in a Wall Street Journal op-ed denouncing Trump and declaring, “Those who see immigrants as easy targets for scaremongering will find that they will lose more than the Hispanic vote; they also will lose those who sing, maybe in different languages, from the same hymnbook.” In May 2016, after Trump provided an NHCLC conference a perfunctory video that included no apology for his anti-immigrant demagoguery, Rodriguez said he had “no plans on endorsing Donald Trump whatsoever.” But Rodriguez threw immigrant families under the wheels of the Trump bus after the candidate’s big meeting with evangelical leaders in June, praising Trump’s comments about abortion, religious liberty and the Supreme Court. Rodriguez had previously given Trump political cover by saying he is not a racist and telling Christians that getting conservative justices on the Supreme Court is more important than immigration reform. Rodriguez also promotes right-wing positions on economics and government regulation. During the congressional battle to pass health care reform, Rodriguez took part in a Religious Right “prayercast” that asked God to defeat the legislation. 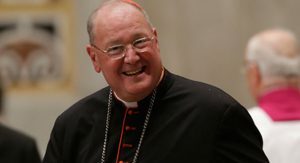 He has signed onto declarations that oppose progressive taxation and embraced right-wing rhetoric about people being “enslaved” by government and “uber-entitlements.” He has promoted the Koch brothers’ LIBRE Initiative, which is meant to proselytize an anti-government gospel of economic libertarianism to Latinos, saying in a LIBRE video that it is anti-Christian and anti-American to “punish success”—right-wing speak for progressive taxation. This entry was posted in Current Events, Politics, Religion. Bookmark the permalink.